The Six-Figure Price Tag for Selling a $2 Hot Dog - Miata Turbo Forum - Boost cars, acquire cats. Vendors at the cart near the Central Park Zoo, in a spot that carries the highest fee among city parks: $289,500. Call it the half-million-dollar hot dog cart. Mohammad Mastafa of Astoria, Queens, has to sell almost that much in drinks and snacks annually to break even on the pushcart he owns at Fifth Avenue and East 62nd Street near the Central Park Zoo. He pays the city’s parks department $289,500 a year just for the right to operate his single cart there. It may seem like an exorbitant amount of money, but it isn’t shocking to many of the other food vendors like Mr. Mastafa who compete to operate pushcarts in New York City parks. The zoo entrance drew the highest bid among the 150 pushcart sites in public parks, but the operators of four other carts in and around Central Park also pay the city more than $200,000 a year each. In fact, the 20 highest license fees, each exceeding $100,000, are all for Central Park carts. “It’s a lot of peanuts, it’s a lot of hot dogs,” said Elizabeth W. Smith, the assistant parks commissioner for revenue and marketing. It is a lot of visitors in need of sustenance. So while vendors are adamant about not divulging details about what they make, most pushcart sites presumably turn a profit or they would not attract such high bids. The annual fee some vendors offer to pay the city has doubled or even tripled in the past 10 years. A decade ago, the fee paid for the pushcart at the Central Park Zoo entrance was $120,000, less than half what Mr. Mastafa paid most recently. The second most expensive cart is on the West Drive at West 67th Street near Tavern on the Green, where the fee is $266,850. For many other parks, especially those in parks outside Manhattan, the fees are much lower — $14,000 in Astoria Park in Queens, $3,200 in Maria Hernandez Park in Brooklyn and $1,100 in Pelham Bay Park in the Bronx. The lowest fee, $700, is paid by the owner of a pushcart near the soccer fields in Inwood Hill Park in Upper Manhattan. Elizendo Vaquero, 50, of the Bronx, has been selling there to soccer players on Sundays since 1989 (since 1997 with a permit). 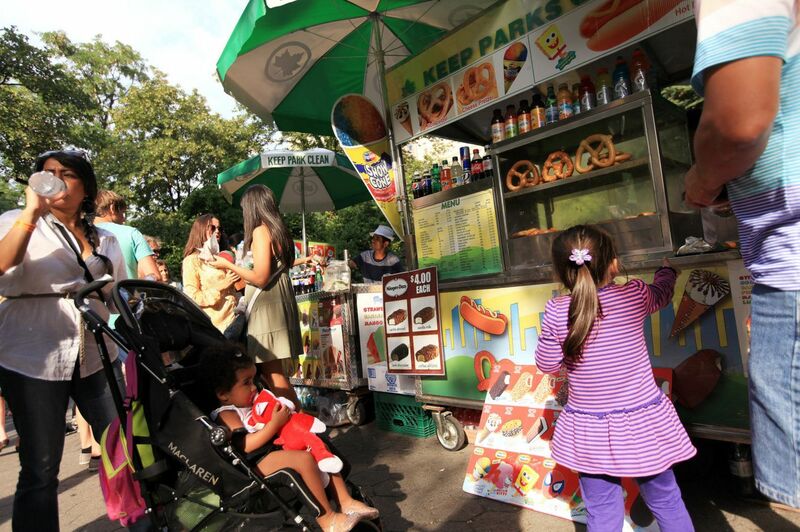 The parks department’s pushcart concessions, which are put out for bid every five years, produce more than $4.5 million annually for the city’s general fund. The vendors who work at the pushcarts are usually not the owners. Ripan Alam, 31, typically works Mr. Mastafa’s cart from 8:30 a.m. to 9 p.m. in the summer and says it makes about $750 weekly, although the revenue produced by sales from the cart fluctuates wildly. Pushcart operators complain that they are being crushed by increasing competition from disabled veterans who compete from choice curbside locations on park perimeters and who can charge less because their license fee to the city is waived under a 19th-century law. Mr. Mastafa, like other operators interviewed, declined to say how much his cart nets. People in the industry suggest their reluctance stems from the fear of competition in bidding when licenses expire, tax confidentiality and dealings with their wholesalers. He referred a reporter to his supplier, Alex Rad, who explained that pushcart economics are more complex than they might seem. Parks were shut during Hurricane Sandy last year and, since the Boston Marathon bombing, vendors are sometimes shooed away from large public gatherings by the police. “Some locations are really losing money,” Mr. Rad said. Mr. Rad has a partnership with New York Picnic Company to supply many of the Central Park pushcarts. He said pushcart operators have ancillary costs, including $20 or so for each delivery of ice several times a day and to transport their carts from warehouses or garages. He estimated that to recoup his expenses, Mr. Mastafa’s zoo pushcart would have to generate more than $425,000 a year in revenue. “We’re dying,” said Ranjit Dev, whose company has the license to several desirable sites in and around Central Park. “How can I pay $180,000 if I can’t sell? How am I going to pay the rent?” Construction near the Metropolitan Museum of Art has also depressed sales at what is typically a prime vending site. New York is a city of superlatives, so the estimated 40 million or so visitors to Central Park a year obviously buy an awful lot of bottled water, ice cream and other refreshments. 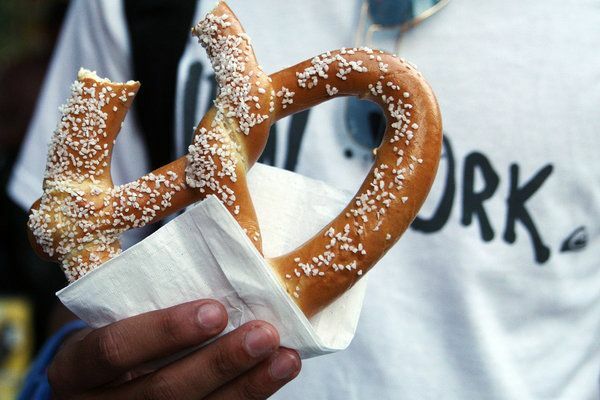 Maximum prices for snacks and beverages are set by the department. In July, even at that price (the maximum for a 24-ounce bottle), he sold 15 cases a day. He typically sells up to 200 hot dogs a day at $2 each. He said the take for the cart ranges from $2,000 a day on a warm summer weekend to $200 in the winter, when he sells mostly hot dogs and nuts. Another pushcart operator, Mr. Amin, who agreed to be identified using only his last name, said the cart he operates at West 67th Street and the West Drive can generate as little as $50 a day in the winter, but $2,500 on a summer Saturday. At his cart and other locations on a recent weekend, sweat-dewed runners finishing their laps ordered frosty Gatorades by color — yellow and orange were the favorites — but water still appeared to be the top seller at most locations.